Every now and then we come across a place to stay that’s truly more than just a place to stay. 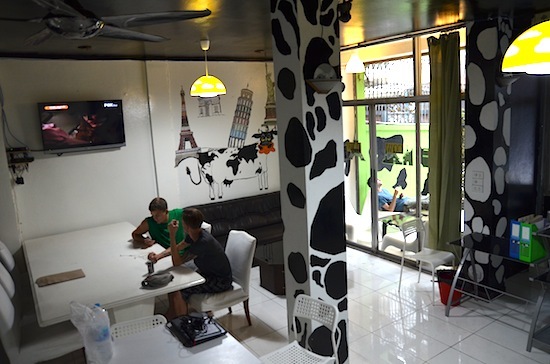 Opened in July 2014 in the vibrant Asok area, COW Hostel offers comfy dorms for less than we’d expect. Beyond that, it hosts a casual English conversation club that meets in the evenings — with free beds for English speakers who are willing to put in some time. Run by an affable Korean man who spent years in Vancouver, Canada, the hostel’s name stands for “Citizens of the World.” His vision had just got off the ground when we stopped by, but he told us that the English Club’s maiden meeting was a success. Sounds like it was more of an eclectic gathering of people from all over the world, as opposed to a strict lesson on tense and conjunctions. English-speaking volunteers can score a free bed in exchange for contributing a few hours to meetings planned for most nights from around 18:00 to 22:00. You don’t need a Master’s in English or even any teaching experience. From what we gathered, the only requirements are dependability; a firm handle on the language; a positive attitude; and a willingness to converse with ESL students. The Club is also a good way to make new friends — and perhaps learn something from them while you’re at it. Whether you’re into the English Club or not, COW is a solid option for anyone looking to stay in the Sukhumvit area on the cheap. 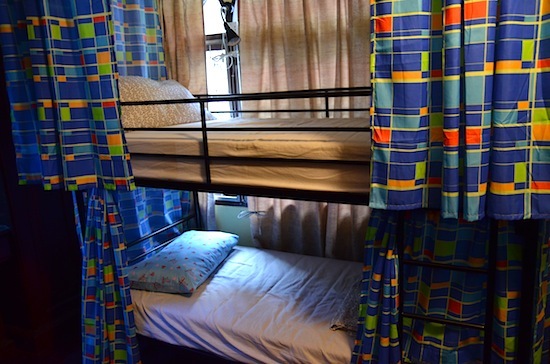 Six-bed, air-con dorms are available in mixed, female- or male-only varieties, with simple hot-water shared bathrooms attached to each of them. While not huge, the rooms are smartly set up with privacy curtains between bunks, all of which bag you a good-quality mattress, reading lamp, electrical outlet and large, lockable bureau. Not too shabby for under 300 baht. A high-end boutique hostel this is not; the floors are scuffed, bathrooms dark and common space minimal. But at 295 baht per bunk, COW offers very competitive value in one of Bangkok’s most expensive neighbourhoods. Right across the lane, the similarly equipped Asok Montri Hostel sells bunks that lack privacy curtains for considerably more cash. If those curtains aren’t enough, COW also has three basic private rooms with large beds, soft lamps, tall mirrors and pink drapes hung over wide windows. 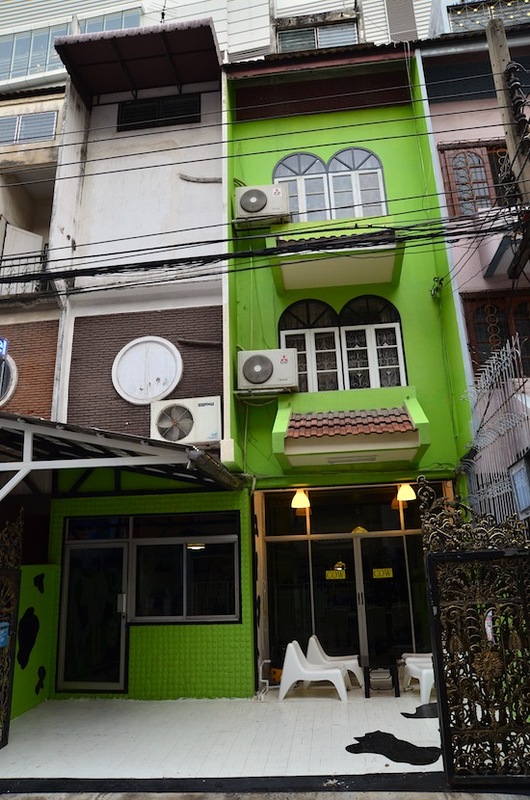 Two of these rely on shared bathrooms and are fan-cooled — suitable for easygoing backpackers but probably not the best bet during hot season. A lone air-con private bags you an ensuite bathroom for only 100 baht more. Punctuated by dairy cow-inspired black splotches on white walls, a ground-floor common room has an LCD TV mounted over a big communal table to go with a nook where you can check your email in the back. There’s also a little front porch for smokers, and we were told that a room on the second floor will be converted into another hangout space in the future. Tucked away down a quiet side lane. The owner also hinted at grander plans to eventually open more COW’s in other regional centres, like Phnom Penh and Yangon. 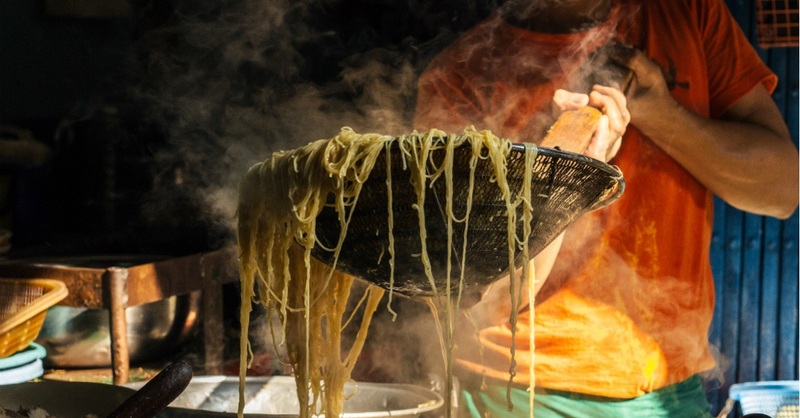 For now, his Bangkok offering is well worth considering if you’re an English speaker looking to save some cash in exchange for a little of your time, a traveller hoping to chat with some of the locals, or anyone after a good, cheap bed near Terminal 21 and Asok BTS / Sukhumvit MRT stations. Check rates at COW Hostel and English Club on Booking.com.